Nope, that’s not in the rental agreement. • Living there. It might sound weird to say, but it’s true — if you’re ever gone for 15 days while the rent is late, we’ll assume you’re gone…only 3 days if we check and your stuff isn’t there, either. Also, no running any kind of a business out of your rental unless you get our approval, meet city requirements and have proper insurance. • Paying your rent on or before the 1st every month. If you’re good about paying on time, we’ll give you until the 5th every once in a while without harassing you, but that’s our choice. There’s a big highlighted section on your lease that explains how you can pay; we’re going to make you read it over there, ’cause it’s too much to summarize here. Anytime you get charged a fee for anything, it counts as rent. That’s important, because it means that if you’re charged a fee and you don’t pay it along with your rent, your rent will still be considered overdue, and you’ll get charged 5% of your rent as a late fee. Every person in the unit is individually responsible for the entire rent amount. In other words, we don’t track “shares” of the rent — if one person is late with their “share,” you’re all late as far as we’re concerned. Choose your roommates carefully! 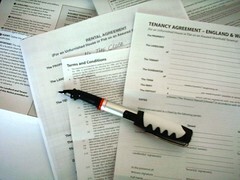 • Getting the utilities transferred into your name within 3 days of moving in. We’ll charge you $50 for every month you don’t get this done, starting on day 4, so be efficient! If relevant, this includes getting a water affidavit, including paying whatever deposits that requires. • Paying the utilities on time. We’ll charge you $50 every month that the utilities are paid late (unless you make a plan with us first) and we’ll still charge you for the entire utility bill plus any late fees the utility company charges you. Also, you must have your final utility bills paid in full within 5 days of moving out and provide us proof. • Not Smoking. Just don’t do it inside any of our homes. Damage from smoking is never “normal wear and tear,” and we will clean it up completely and then charge you for it. • No drugs, either. Don’t use ’em, and definitely don’t grow, create, or sell ’em. • Keeping the number of human and animal occupants down to the number we’re aware of. We charge high fees if we find out that people and pets are living there without our knowledge. • Keeping the safety equipment functional. That includes keeping smoke detectors working. We put in expensive 10-year batteries and you’ll be charged if they disappear. • Keeping track of your keys.We charge $25 to replace a key, and $50 if you request us to come let you in because you locked yourself out. • Telling us, on the 1st of a month, at least 60 days before the end of your lease if you don’t intend to renew. If you don’t give us at least that much notice, your lease will automatically renew for another year and your rent will automatically go up 5%. Furthermore, if you need a few months extra but you can’t (or just don’t want to) renew for an entire year, your rent will go up 10% instead of 5% when your lease converts to a month-to-month situation. • Telling us within 4 days when you move out, so that we can commence our post-move-out inspection and calculate how much of your security deposit we can return. Expect not to get anything back for about a month; Michigan law gives us 30 days and we usually take almost all of it to get all the way through our process. • Grass and Snow carevaries by property, but if you’re in a single-family unit, it’s almost always your responsibility. If you let it go too long and we have to have someone come in and take care of it, we’ll charge you for the work plus a 20% “making us keep track of stuff we don’t want to” markup. • General Maintenance has another big, highlighted section in our lease. That’s the other section we’re going to ask you to read in the actual lease. It’s very important. Also be aware that we don’t cover costs for furnace or air filters, and we charge $75-100 for a tech to come replace those, so it’s probably worth your time to hit up YouTube and figure out how do to that for yourself. • Special Maintenance, or “any time you have to request a crew come out to fix something, but it’s not an emergency,” must be requested in writing. If you request a maintenance appointment and then you’re not there to let them in, we charge you $50. You are obligated to let us know within 24 hours of noticing a water leak, whether from interior sources or from outside water getting in. • Getting written consent from us before doing any of your own remodeling or construction. • Working with us to allow our inspectors to do their jobs as necessary. • During the last 30 days of your lease, working with our agents to allow us to show the property to potential new renters. Wow, that’s a pretty long list, even in plain English! Thank you for reading and understanding it. And check back next month for the plain-English version of what our lease requires us to do for you! Rents are on the Rise, Have You Considered a Long-Term Lease? Royal Rose Properties was incorporated in 2001 after operating as a DBA since 1998 and is a licensed Michigan Real Estate Broker specializing in the rental market (ID# 6505355878). Hiring us to manage your rental property. Looking for a home to rent. Thinking of selling your rental or buying more. I’m Moving Out! Can I Get My Security Deposit Back ASAP? !